There are a lot of different wheels out there, and often times, for the discerning motorist, it can be used as part of their car’s complete aesthetic. And it doesn’t just involve the look of the wheel, it’s also the material of the wheel. The material used can determine a lot of things when it comes to your car, and it’s one of many things that make up what ultimately decides your car’s performance as well as safety. With looks aside, read on to find out what it could mean to choose alloy wheels vs steel wheels, and what they mean for your car! These wheels are generally lighter than their steel counterparts and are usually made from an aluminum/nickel alloy combination. Thanks to its lightweight, alloy wheels are superior when it comes to better performance and acceleration—these are the wheels that helped further the evolution of motorsports! Also, the materials used allow for some improved heat conduction in the wheels. And what’s more, thanks to their nature, alloy wheels can be cast and changed to come in a variety of designs, so it’s easier to give your car its own individual, customized look. Basically, if you’re a real motor enthusiast, you’ll be wanting to get alloy cars. And you may find yourself saving a few bucks during your day-to-day driving thanks to the lighter weight of the alloy wheels. Thanks to that weight, your fuel economy will be noticeably improved. Alloy wheels may be the motor enthusiast’s best pick, but they are not perfect. While they certainly score when it comes to style points, alloy wheels are not as tough as the competition. Whether it’s from terrible pot holes or just running across a curb, you can bet that your alloy wheels will be more prone to damage. This can range from just unsightly cosmetic damage to more serious damages such as the wheel bending or even cracking from the sudden stress. 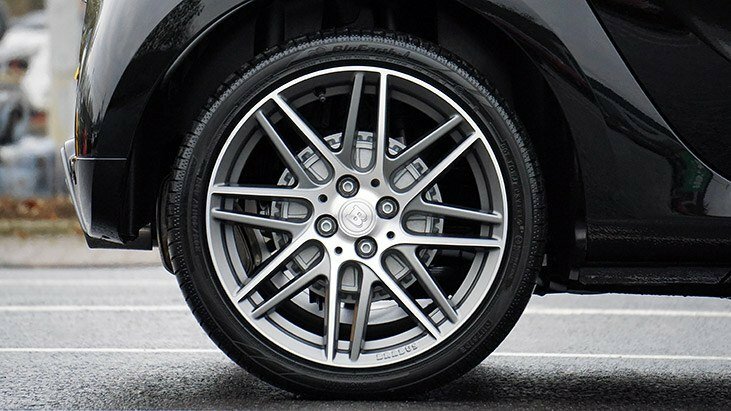 While alloy wheels are perfect for summer performance driving, if you find yourself caught in a bad winter, you’ll find these lighter wheels to be a hassle when navigating snow. Because of the wheel’s lighter weight, your car’s center of gravity will be shifted to more top-heavy and you may find yourself prone to swinging, sliding, and skidding more often. Also, beware of salt—alloy wheels are more prone to corrosion from saltwater, and you can bet that road salt during the winters won’t be kind to your wheels either. You will need to clean your wheels frequently to prevent any corrosion from occurring. Last but not least, alloy wheels are more expensive than steel wheels. There are a greater number of varieties to choose from, but you’re likely to not find a “discount” alloy wheel around compared to looking for cheaper, steel alternatives. Steel wheels are made exactly of that: Steel. They are cheaper than their alloy counterparts, but you can expect them to be much stronger. Between the two wheels, steel wheels are the more durable of the two, and they can withstand a lot of different forces and elements before getting damaged. In fact, it’s almost impossible to crack a steel wheel, and should it somehow get bent after being severely impacted, it can be beaten back into shape without affecting the appearance too much. When it comes to fighting rust, if you have a rust-fighting paint, you can prevent rust by maintaining the paint coat on your wheels. Given how relatively unremarkable steel wheels are aesthetically, you also don’t have to worry much about cosmetic damage. If you have your wheels painted, you can also just reapply a new coat if you feel like it. Otherwise, cosmetic damage would be hard to notice on a steel wheel anyways. The extra weight is also incredibly handy for when you’re driving in areas that have harsh winters. The increase in unsprung weight will anchor your car down, giving it a lower center of gravity, and enable you to tackle the snow and ice with a lot more control than with the alloy wheels. All in all, this is the perfect wheel for those in winter-heavy areas, and for those who don’t care too much about looks but want a tough and reliable wheel for their car. The same reason why these wheels are amazing in winter weather is also one of the reasons why these wheels aren’t so great during summer weather. They are heavier than alloy wheels and so they can be a burden on your gas economy once the winter weather passes on and it’s back to clear roads. And while these are super durable, they aren’t the most flattering to look at, making them a lot less desirable for motor enthusiasts. That isn’t to say that wheel covers don’t exist for steel wheels, but it still doesn’t match the aesthetic of alloy wheels. Along with reduced gas economy, steel wheels can reduce acceleration and vehicle agility, which ultimately puts more strain on your suspension along with other parts of your vehicle. This can result in more costly maintenance and faster wear-and-tear. Steel wheels are also not as variable as alloy wheels. They come in limited sizes of usually 16” size rims or less, and they usually are not compatible with some vehicles such as larger ones or high-performance cars. In the end, regarding alloy wheels vs steel wheels, it really comes down to your aesthetic needs versus your practical needs. Are you a motor enthusiast who cares a lot about your car’s style points? Are you a fan of giving your car a more individualized, custom-look? Or are you more about making sure your car gets from Point A to Point B with the least trouble? Your geography matters as well—do you have harsh winter seasons? Or maybe you have no winters? By answering these questions and assessing the pros and cons we’ve presented, you’ll be better able to figure out which wheel type is best for you and your car!